Here is a recipe that can help you boost your immune system, improve and nourish your skin and keep your vision sharp! 1. Melt the butter in a sauce pan, add the flour and cook on a slow flame while stirring continuously until froth appears. 2. Add milk and ½ cup of water gradually and continue stirring till the sauce thickens and no lumps remain. 3. Add the salt and pepper and mix well. Keep aside. 1. Heat the butter in a pan; add the onions and sauté till they turn translucent. 2. Add green chilies and sauté again for ½ a minute. 3. Add paneer, corn, coriander, white sauce and salt and cook for 2 minutes. 1. Keep the spinach leaves in salted hot water for 5 minutes. Drain completely. 2. Put a little filling on each leaf and roll it up tightly. 3. Spread 1 cup of white sauce on a greased baking tray. Arrange the rolls in the sauce and pour the remaining white sauce on top. 4. 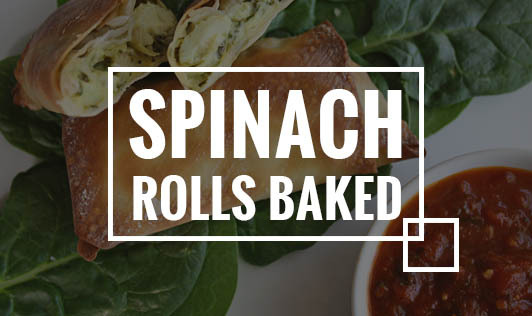 Sprinkle cheese over the spinach rolls and bake in a pre-heated oven at 230°c for 10 minutes.